During summer, very lightly water surface of pots weekly to prevent tuber desiccation especially if dormant seedlings are in the pot. Divide overcrowded pots in summer. Tip out and break into slices like cutting a cake. Stand a slice in a new pot & fill spaces with fresh mix. Take care to keep the surface layer at the surface of the new pot. Add fresh leaf litter to surface layer in January to February to March. If surface moss gets too thick, peel it off and discard in summer. Start heavier watering of pots weekly from mid March. Mix seed with fine dry sand and sprinkle on mother pots in April. Water as required in autumn, winter & spring so that pots never dry out during the growing season yet are not soggy wet. Leaves appear from Anzac Day to June. Look for flower buds down inside the largest leaves from mid July onwards. Look for new seedling leaves from August to October. Enjoy and photograph flowers September to November. Hand-pollinate flowers in September – October. Flowers collapse within days of fertilisation. Collect seed pods as they turn brown just before they split open in November – December. Dry & store seed over summer in paper envelopes kept indoors. Allow pots to slowly dry out in mid – late November to induce dormancy and ripen tubers. Plants die down completely in summer to underground tubers. ‘Orchids Australia’ February 2006, P58, or ‘The Orchadian’ Vol 15, Number 3, March 2006, P100. 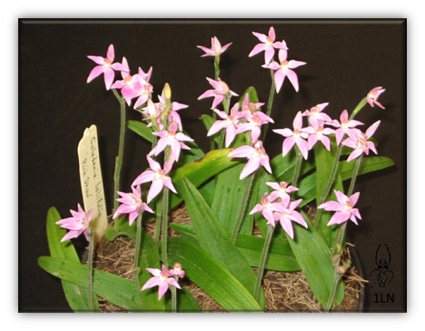 This entry was posted in Articles, Growing Terrestrials and tagged Australian orchids, Growing Australian Orchids, growing terrestrial orchids, Growing Terrestrials, orchids, terrestrial. Bookmark the permalink.